Canal milepost 30 marks the site of a ferry that operated on the river from 1791 until 1836. The area was the site of a large Union crossing on the way to Gettysburg in June 1863. An abandoned building along the canal was once a store. The lock at Edwards Ferry was large enough to handle two boats going through at the same time. 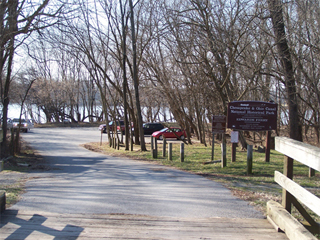 Edwards Ferry has a large boat ramp and is a popular spot for fishing in the Potomac for smallmouth bass. Access is via Edwards Ferry Road, 4.5 miles west of Poolesville, Md.